I had been looking for a while, but couldn't really settle on any pattern, so in the end I just made my own. 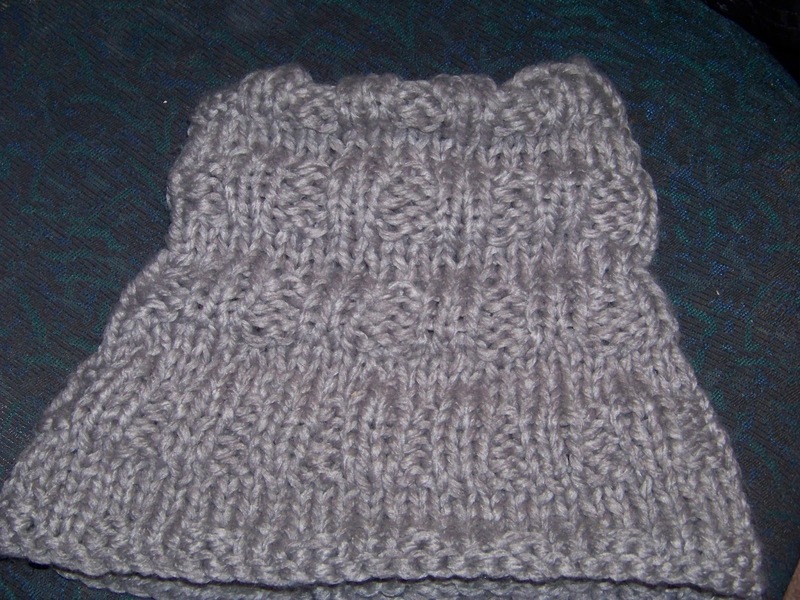 It was a really fast knit, so I didn't feel too bad (and only slightly frustrated) when I had to undo it all over and over and over again to get the size right. 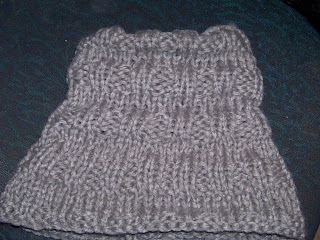 The yarn is Moda Vera Shiver in grey left over from the cardigan. 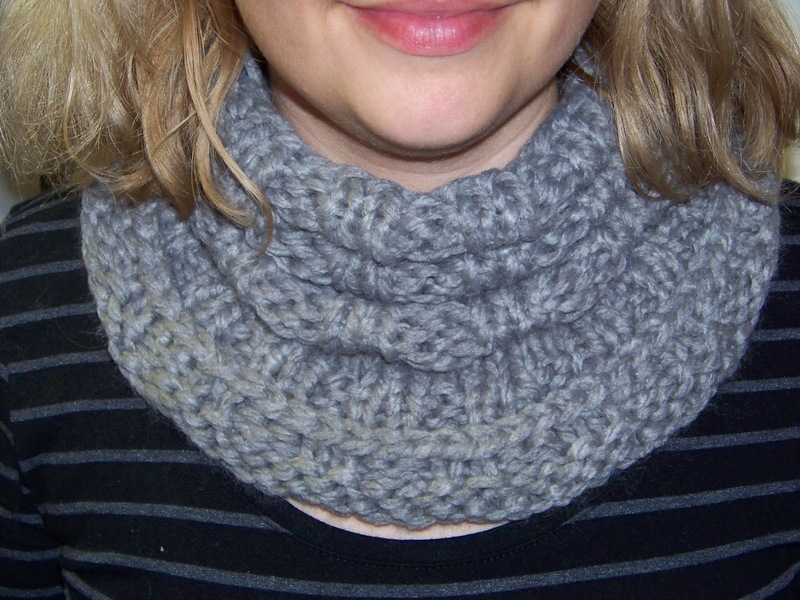 The yarn is very bulky, so I didn't want a cowl that needed to be looped around the neck. Firstly I cast on 92 stitches and worked in the round, but it was clear after about 5 rows that it would be beyond massive. 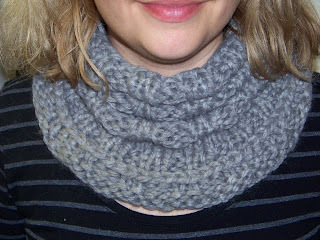 Next I cast on 80 stitches and I did the whole cowl and it turned still way too big. Version 3 was slightly better with 66 stitches, but was still gaping at the top. I needed it to be somewhat snug fitting, otherwise my neck would get cold, but not too snug otherwise it wouldn't fit over my head. Slightly frustrated I then cast on 42 stitches and started with that. I did 3 broken ribs and then cast off. All the way through I thought it was going to be too small, but I stuck with it and ended up with the top half of this. My cast off is tighter then my cast on, so it was barely big enough to fit over my head. I wore it all day around the house, and whilst it was snug and warm around my neck, my décolleté (the part of my torso above my bust) got cold. So off I went and undid my cast off. I increased and increased and ended up with a kinda triangle shaped tube. Despite it being slightly odd looking, it is perfect for my neck. I call this a win. Maybe I'll make another one in blue .. hmmm. finish off by sewing the seam to form a tube. On other news, I made a chocolate cherry brownie, where I didn't melt the chocolate, instead added it as chucks and then added a jar of heated cherries (without the juice). 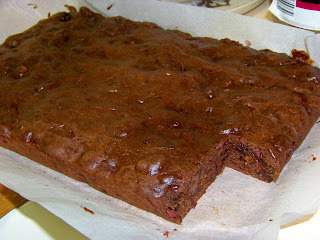 It melted the chocolate slightly and was very yummy.